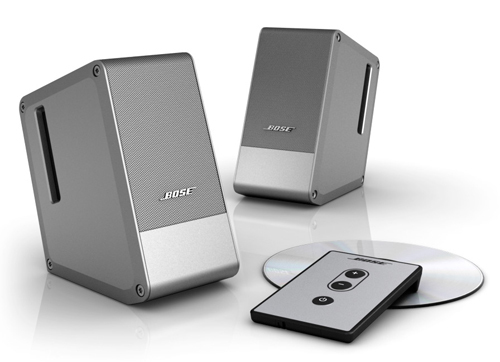 The Bose Computer MusicMonitor desktop speakers hold true to the big Bose sound while having one of the smallest speaker foot prints on the market. Â The Computer MusicMonitor speakers excel at mid and upper range frequencies. Â Their naturally small size limits there bass output and Bose seems to have chosen the more linear path and does not unnaturally boost the low end. Â If you enjoy the sound of other Boss speakers in your home you should consider the Computer MusicMonitor’s for your desktop. Â You won’t be disappointed. The MusicMonitor’s transducers are very thin and have a powerful magnet, this allows the speakers to play fast and for you to enjoy dynamic music. Â This also means there is very little smearing of the sound. Â See a slow speaker will physically smear the sound because it is not able to keep up with the change in theÂ electricalÂ wave that pushes the speaker. Â The result is smearing and slowÂ transients. Â Sometimes the sound stage will be effected as well and you’ll not be able to hear the space the music was recorded in. The Bose Computer MusicMonitors may not be very everybody. Â First off, they are expensive. Â Even with their newer price, $100.00 less, they are still $299. Â Also if you crave bass you’ll be dissatisfied. Â You may want to consider a 3-way system like Klipsh’s ProMedia 2.1 speaker or the Audioengine’s A2 speakers which are very similar to the Bose Computer MusicMonitor’s but with significantly more bass. Â If you like open and natural sound you may also consider the Serene Audio Talisman speakers.